Despite multiple studies demonstrating the importance of the anti-apoptotic proteinMcl-1 in tumor cell survival and treatment resistance, a clinically importantinhibitor has yet to be developed. A recent study by Guo Wei and colleagues publishedin Cancer Cell has utilized a novel high-throughput approach to identifycompounds that act as transcriptional repressors of MCL1 expression. Theirfindings identified a number of candidate drugs to be tested for clinical relevancein human cancers dependent on MCL1 expression. Mcl-1, a Bcl-2 family member, plays a central role in the ability of cancer cells toresist apoptosis and growth arrest, yet effective clinical treatments targeting itremain out of reach. A recent study by Guo Wei and colleagues utilized a high-throughputscreening method to analyze a library of compounds, to identify those thatpreferentially repress MCL1 expression . By inhibiting MCL1 expression relative to that of other Bcl-2family members (both anti and pro-apoptotic), cells were induced into apoptotic celldeath. Their screen identified a number of commercially available compounds, includingseveral drugs widely used in cancer chemotherapy, and suggests their use could improvetreatment outcomes in Mcl-1-dependent tumors. Members of the Bcl-2 family are highly conserved proteins intimately involved inregulating cell survival. Bcl-2 family members can be divided into three groups based onfunction and structural homology between the four conserved Bcl-2 homology (BH) domains.Of these, the most highly pro-survival members share multiple BH domains, includingBcl-2, Bcl-xL and Mcl-1. One of the major survival mechanisms, for which there has beensignificant clinical interest, is through heterodimerization with pro-apoptotic familymembers (BH3-only type) through a cleft consisting of multiple BH domains . Despite structural and functional similarities, Mcl-1 possesses distinctcharacteristics that set it apart from other Bcl-2 family members. For instance, theaforementioned BH3-only binding cleft within Mcl-1 differs from its congeners and thisis a major reason why some BH3 inhibitors fail to recognize it. For instance, theexpression of MCL1 contributes to resistance to the novel Bcl-2/Bcl-xLinhibitor ABT-263 (Abbott Laboratories, Abbott Park, IL, USA) . Also, from a drug development standpoint, the Mcl-1 protein has aparticularly short half-life of a few hours, and undergoes rapid degradation. From apotential toxicity standpoint, MCL1 expression is essential for the survivaland function of hematopoietic stem cells . Complicating its role as an anti-apoptotic agent, Mcl-1 appears to have distinctadditional functions, such as resisting chemotherapy-induced senescence . Conversely, ablation of MCL1 in experimental systems results inenhanced sensitivity to chemotherapy, and can induce dramatic levels of apoptosis andsenescence even in untreated tumors [5, 6]. 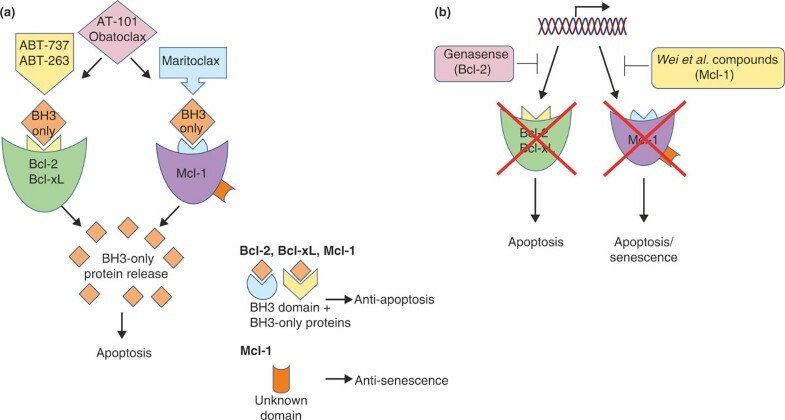 Regulating the balance between apoptosis and senescence is a key function ofthe Bcl-2 family. Given the powerful anti-apoptotic and anti-senescence abilities ofMcl-1 in particular, it is not surprising that cancers have taken advantage of thesepathways to promote survival and growth. Mcl-1 plays a unique role in tumorigenesis and cancer progression; the MCL1 locus (as well as BCL2) is one of the most highly amplified in all humancancers, with a direct link to tumor development . Although Mcl-1 was initially studied in hematopoietic tumors, it is clearthat many solid tumors are also dependent on this survival factor. Despite theimportance of Bcl-2 molecules like Mcl-1, clinically effective inhibitors remainelusive. For example, in clinical trials the anti-sense oligonucleotide Genasense(Genta, Berkeley Heights, NJ, USA), specifically targeting BCL2 mRNA fordegradation, has shown little promise. Similarly, the pan-Bcl-2 inhibitors (which targetMcl-1) AT-101 (Ascenta Therapeutics, Malvern, PA, USA) and Obatoclax (Cephalon, Frazer,PA, USA) showed promise in pre-clinical models, but have yet to demonstrate significantclinical benefit. Interestingly, ABT-263 (Navitoclax), which does not target Mcl-1, hasshown some activity in a variety of cancers, but with significant toxicities . Many of the clinically relevant Bcl-2 family targeting drugs are shown inFigure 1. Clinically relevant strategies for specific inhibition of Bcl-2 familyproteins. (a) Inhibition of the BH3-binding domain leads toapoptosis by decreased binding/sequestration of BH3-only proteins. Drugs such asABT-737 and ABT-263 inhibit the BH3 domains of Bcl-2 and Bcl-xL, while Maritoclaxinhibits Mcl-1. AT-101 and Obatoclax inhibit the BH3 domain of all Bcl-2 familymembers. While inhibition of the BH3-binding domains enhances apoptosis, thedomains of Mcl-1 that resist non-apoptotic processes (for example, senescence)remain unaffected. (b) Repression of Bcl-2 family protein production leadsto both apoptotic and non-apoptotic growth arrest by limiting the availability ofeach protein. Specific inhibitors have been designed, such as Genasense, anantisense oligonucleotide that targets BCL2 mRNA. On the other hand, thecompounds identified by Wei et al. preferentially affect MCL1.Future combinations of these therapies could hold the key for more clinicallyeffective treatments. These inhibitors assume that the main function of Mcl-1 is through its BH3-bindingpocket, a supposition that is now being challenged . This concern can be partially addressed through the use of agents thatreduce MCL1 levels through inhibiting production or enhancing degradation.Multikinase inhibitors such as sorafenib, cdk inhibitors such as roscovatine, anddeubiquitinase inhibitors such as WP1130 all significantly reduce MCL1 expression. However, none is specific for MCL1 expression and they altermany signaling pathways that may counteract their repression of MCL1 expression . Therefore, neither non-specific inhibition of MCL1 expression nortargeting the BH3-only binding pocket may ultimately prove to be clinicallyeffective. With the need for more specific Mcl-1 inhibitors in mind, Guo Wei and colleagues  screened for small molecule repressors of MCL1 expression. Using aLuminex bead-based method capable of examining global mRNA levels, the screen focused oncompounds that repressed MCL1 expression (while not immediately causing celldeath) relative to 48 other pro-apoptotic genes. Screening a library of 2,922 compoundsobtained from the Broad Institute Chemical Biology Program, which included 530 US Foodand Drug Administration-approved drugs, gave 24 candidates, of which 7 were chosen forfurther study based on commercial availability (likely excluding many newly discoveredinhibitors) and clear dose-related repression of MCL1 mRNA levels. Thesecompounds included triptolide (a herbal extract possessing pro-apoptotic effects), thetranscription inhibitors 5,6-dichlorobenzimidazole riboside and actinomycin D, a kinaseinhibitor 5-iodotubercidin, and the anthracycline drugs doxorubicin, daunorubicin andepirubicin. Resistance to these compounds could be induced by ectopic MCL1 expression, and RNA interference (RNAi) knockdown of MCL1 could phenocopythe transcriptional profiles of drug treatment in multiple tumor cell lines. The compounds found induced similar transcriptional responses despite having differingcytotoxic mechanisms, strongly suggesting these agents caused a generalized repressionof transcription. This hypothesis was strengthened by the fact that the anthracyclinedrugs identified, known for their inhibition of DNA topoisomerase II, induced markedlydifferent transcriptional profiles compared with etoposide, another topoisomeraseinhibitor, which did not affect MCL1. These data indicate that the specificity of the transcription repressing (TR) compoundsfor MCL1 is primarily due to the short half-life of Mcl-1 protein, in that itshigh rate of degradation reduced its relative production while transcription wasglobally repressed. In effect, these compounds act as indirect suppressors of MCL1 expression, highlighting the limitations of the screening strategy. While usinggeneral transcription repression rather than specific inhibition has the advantage ofidentifying a wide array of compounds utilizing potentially novel mechanisms, clearlythis approach cannot distinguish between target-specific mechanisms (that is, those thatact directly on MCL1) and general mechanisms that happen to affect MCL1 preferentially. While the compounds chosen for further study induced similarindirect effects on MCL1 expression, it is possible that other compoundsidentified in the screen, but not yet tested, could be more specific repressors. Infact, other studies have found that low levels of doxorubicin, identified in thisscreen, do not significantly alter MCL1 expression . Cancer is a heterogeneous disease, and tumor cells can have differing dependencies onpro-survival mechanisms regulated by Bcl-2 family proteins. Indeed, while conductingtheir screens, Wei et al. identified a number of cell lines that continued to resist apoptosis afterknockdown of MCL1 by TR compounds or RNAi. The authors returned to theirgenomic screening model to identify genes whose expression correlated with sensitivityor resistance to MCL1 repression. Genetic profiles (gene copy number andexpression data) for over 18,000 genes and known mutation data for 34 genes over 72 celllines were correlated with relative sensitivity to TR compounds. The screen identified asingle candidate: the closely related Bcl-2 family member Bcl-xL. High BCL2L2 (the gene encoding Bcl-xL) expression correlated with resistance to MCL1 repression while low BCL2L2 expression was associated with sensitivity.Both Mcl-1 and Bcl-xL could bind the pro-apoptotic proteins Bim and Bak, and the releaseof these molecules contributed to apoptosis induced by TR compound treatment, suggestinga level of redundancy not previously reported. Given that MCL1 expression is a known resistance mechanism for inhibition ofother BCL2 genes, this result is not surprising. Further, it suggests thattranscription-repressing drugs would be most efficacious in cancers possessing lowBCL2L2 expression. Also, using the technology employed by Wei etal., additional drugs could be discovered by focusing on BCL2L2 expressionto synergize with those already identified that affect MCL1. An intriguing aspect of this study is that many of the identified TR compounds arealready in clinical use, particularly the anthracycline drugs. The evidence that theyexert at least part of their cytotoxic effect via repression of MCL1 is novel,and suggests that regimens designed to take advantage of this process could enhance itsefficacy. Further studies to identify optimal dosing and scheduling are clearly needed.With the apparent importance of MCL1 expression in many cancers, the hope isthat beneficial synergies could be found, particularly in combination with other Bcl-2family inhibitors. Finally, the chemical genomic approach taken by Wei et al.has promise as a method to discover other novel specific transcription repressors ofMCL1 and other genes, and as a means of identifying possible combinations ofexisting chemotherapeutics to optimize their efficacy. This strategy could be especiallyhelpful in combating therapy-resistant cancers, and used in personalizedcancer-treatment models with a goal of optimally inhibiting specific genes andpathways. BRG, LWP and AD are supported by NIH grant R01CA132796.